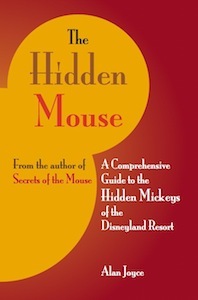 From the author of Secrets of the Mouse comes the most complete, easy-to-use reference for Disneyland's Hidden Mickeys ever published. All of the mouse's hiding places are revealed in 116 beautiful full-color pages featuring hundreds of photographs, helpful tips, and bonus behind-the-scenes information about dozens of rides. Organized for quick and easy reference of any ride or location across the Disneyland Resort in Anaheim, The Hidden Mouse is your convenient and comprehensive companion to finding Disneyland's Hidden Mickeys. A comprehensive of list currently known Hidden Mickeys in Disneyland, Disney's California Adventure, Disneyland Resort Hotels, and more. High-quality color photos of many Hidden Mickeys. Helpful tips for locating each Hidden Mickey. Behind-the-scenes information and fun facts about dozens of attractions across the Resort. Secrets of the Mouse is a unique look at Disneyland Park in Anaheim, CA. 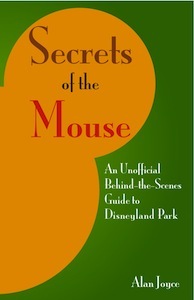 It presents a view of the park from a behind-the-scenes perspective, with information about the hidden secrets and inside jokes scattered throughout Disneyland. It is intended to be a look at the magic behind the magic of Disneyland, and will give the reader a greater appreciation for the incredible efforts and innovations that create the Disneyland experience. If seeing how a magic trick works spoils the fun for you, then you might want to try another guide. However, if you find yourself asking "How do they do that?" when you see an oncoming boulder in Indiana Jones or translucent ghosts in the Haunted Mansion, this guide is here to satisfy your curiosity. Behind-the-scenes information for every attraction in the park. Tips on where to spot the special touches and inside jokes. A comprehensive list of the most notable Hidden Mickeys in Disneyland. Puzzles and games to be played while waiting in line for specific rides. © 2011-2014 Alan Joyce. All rights reserved.